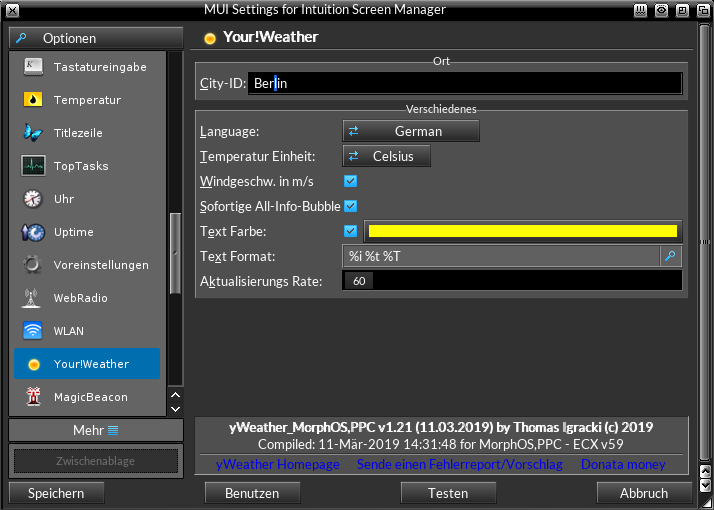 If you move the mouse over the sbar and wait some seconds, a bubble pops up, showing all available weather informations. If you click with the left mousebutton on it, a popup menu will be opened to manually get new weather infos or checking for an update. Since v1.19, yWeather will check 30 secs after the first sucessfull weather update, if there is an update available. You can change the location in the Screenbar-Settings (right click on the screen-depth gadget, then choose "Settings"). Then click on "Your!Weather" in the left list. Then click in City-ID string gadget and enter your location, f.e. "Berlin,DE". After a successfull retrieving of weather infos, the ID is used! The default location is Berlin. 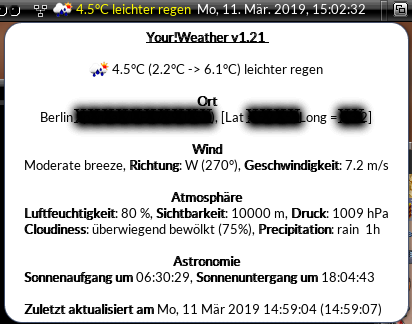 You can also change the unit of the temperature to Celsius, Fahrenheit or Kelvin, if you want the wind speed in m/s, the text color, the text format and the update rate how often the weather informations should be trieved (in seconds). copy contents of "SYS" to SYS: These are the icons for the weather conditions. You can replace them with your own images. copy the catalog of your language to the appropriate directory in Locale:catalogs/. Have fun with it, and if you have some ideas/bug reports send it to yWeather(at)igracki(dot)de.